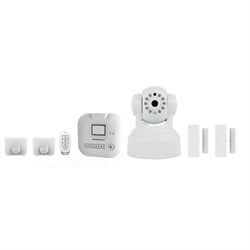 Skylink’s SK-250 alarm and automation starter kit provides you with the basics needed to get you started on your do-it-yourself alarm security and control system. The SkylinkNet Internet enabled Hub connects to your local network and provides easy cloud based remote control and notifications. The starter kit comes with a motion sensor, keychain remote as well as two door/window sensors. Up to 50 wireless sensors and up to 10 cameras may be used. There are no set-up or monthly fees. Use the free iOs or Android app to arm and disarm your alarm and control your system from almost anywhere. Push notifications can be sent to your smartphone whenever a door or window is open or in case of an alarm. You can also trigger alarms when viewing live video monitoring. SkylinkNet works with Amazon Echo and Dot as well as IFTTT (If This Then That) so you can integrate it with all kinds of other devices including August, Nest and Hue to name a few. Plus, IFTTT allows custom events such as arming the device when you drive away from home. 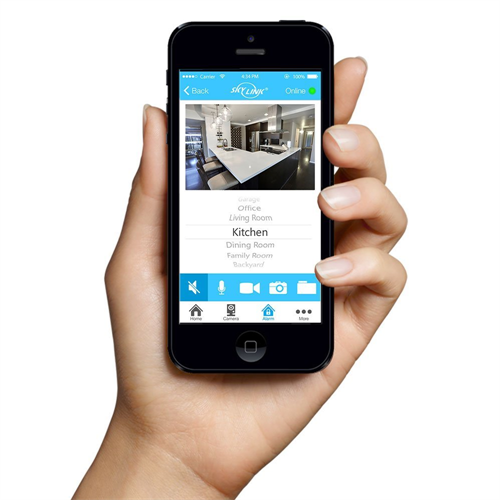 Learn more about IFTTT integration at http://skylinkhome.com/skylinknet-ifttt. In the case of a power failure, back up batteries let the local system continue to operate and sound an alarm if needed. Batteries are not included in the kit. Note: For Internet access during a power failure, your router, modem and other network equipment would need to have a UPS battery backup. An emergency telephone voice dialer can be added to notify neighbours, friends or family in the case of an alarm being triggered.